Sagging eyebrows is a common sign of aging around the eyes that many of our patients are seeking treatment for. Non-surgical treatments to compensate for the loss of main structural proteins of the various connective tissues and elastic, fibrous glycoproteins are available to achieve brow lifts that will give one a fresher, more youthful appearance. There are 2 main options for sagging brows or brow lifts available at Nitai Medical & Cosmetic Centre depending on your pre-existing condition. The antiwrinkle injection and /or dermal filler injection can be used to reduce brow sag. The brow is supported by muscles around the eyes and in the forehead. By injecting anti wrinkle product into the muscles surrounding the eyes, these muscles relax and therefore the downward pull on the eyebrows is reduced. The change in the brow line often needs to be only a few millimetres to achieve the desirable effect. At Nitai, anti wrinkle injections are only administered by an experienced doctor using only the best antiwrinkle product available on the market. This ensures that anyone desiring a brow lift will always experience treatment with no compromises. The antiwrinkle injections used at Nitai last 4-6 months. Some patients suffer from a bony appearance around the eyes and require additional support in the eyelids. Injection of dermal fillers in the mid section of the eyelids provides the needed support to create a lift of the brow line. This dermal filler treatment also has the effect of softening the appearance of the eyelid area and giving a fresher , more youthful look. 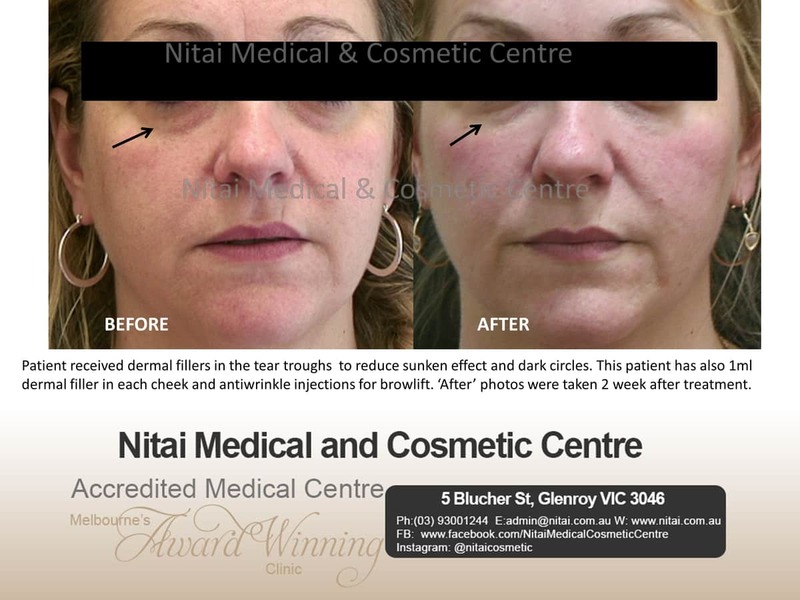 The dermal fillers used for the eyelid area at Nitai last between 9-12 months. If you are looking to replace the tired look around the eyes with a more youthful, confident appearance through improved brow lift and softened eyelid appearance, then before you make a decision about your treatment, take up our offer of a No obligation, cost free consultation with our experienced cosmetic doctor.